The nature of demand now in 2018 vs when we started in 1988. Evolution of table olive trends around the world over the past 30 plus years. Identification of major trends within the olive market. Hints and comments for growers. Establishing a market for your olive products both locally and internationally. 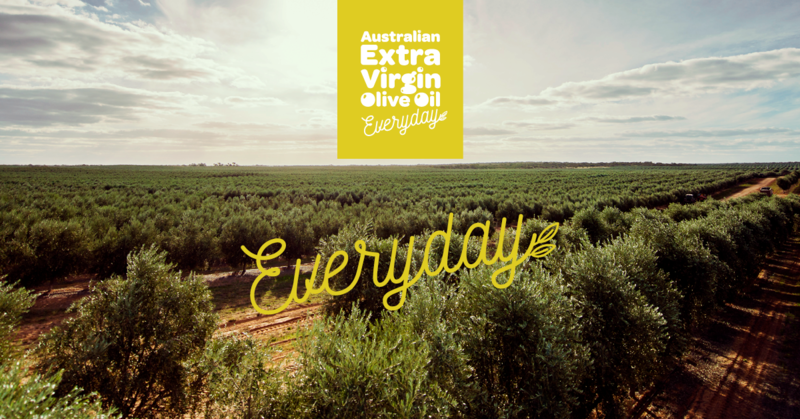 Our perspective on the future of the table olive market in Australia over the coming 20 years. Explores sensory evaluation of table olives and how this may relate to consumers. Transforming raw olives into safe, edible and nutritious table olives involves pre-processing, processing and post-processing stages. Food safety for table olives, relies on Good Agriculture Practice (GAP), Good Hygienic Practice (GHP), and Good Manufacturing Practice (GMP). These practices must be consistent with the principles of Hazard and Critical Point Analysis (HACCP) so that potential hazards are identified and managed before, during and after table olive production. Signatories to the OliveCare® Code of Best Practice for table olives are required to undertake specified physical, chemical, microbiological and organoleptic testing of a sample taken from each batch identified on table olive product labels to establish eligibility to apply the Certified Australian Table Olives™ Certification Trademark, in accordance with The Voluntary Industry Standard for Table Olives in Australia (RIRDC 2012). This presentation covers topics including: Why have a voluntary standard? What to test for, why test for some things and not others? Frequency of testing – do you test every barrel, every batch, or only one sample per year as specified in HACCP. 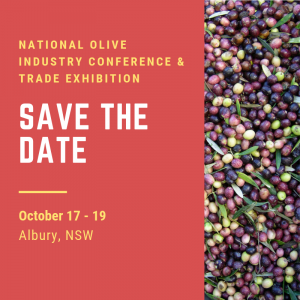 Why are there differences in testing requirements for OliveCare®, entry to competitions, HACCP accreditation, and legal requirements for sale of table olives to the general public. Signatories to the OliveCare® Code of Best Practice for EVOO are required to undertake specified oil chemistry testing and sensory assessment for each product label to establish eligibility to apply the Certified Australian EVOO® Certification Trademark, in accordance with The Australian Standard for olive oils and olive pomace oils (AS5264-2011). This presentation covers topics including: What is OliveCare® and what has been achieved? 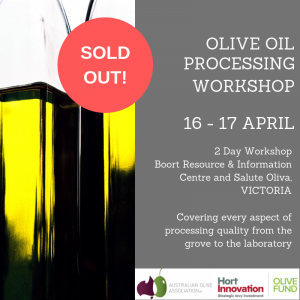 Managing risks to olive product quality; What do market surveys tell us? 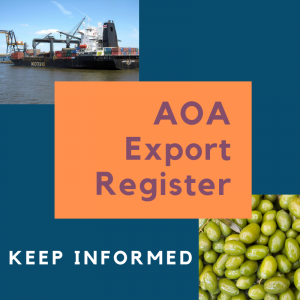 Use of AOA certification trademarks; OliveCare® compliance requirements; OliveCare® training program; and some take home messages. In recent years, the application of high frequency ultrasound standing waves (megasonics) on olive paste has proven to provide additional olive oil extractability. 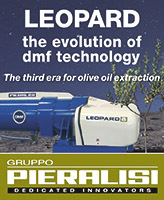 The technology has been demonstrated from laboratory to industrial scale both in Australia and Italy, recently showing improvements of up to 4% oil recovery (oil in fruit basis) at 3 tonnes per hour. This presentation addresses the development of the technology and benefits on olive oil yield, malaxation time reduction, and increase in phenolic content in oil. Despite being considered one of the most drought-tolerant crops, intensive commercial production of olives requires irrigation. Optimal management of irrigation can save water and improve yield and quality. In this study, the effect of regulated deficit irrigation on yield and quality of different olive varieties was investigated. The effect of watering regimes on maturity, oil concentration and oil extraction efficiency was analysed from multiple-time harvesting of different olive varieties treated similarly. This presentation covers the best way to store your EVOO for to enable the product to last as long as possible and alleviate defects. It also looks at the best way to ship and store your oil prior to bottling.